Five-year-old Daisy Gonzalez’s father is always waiting for her at the bus stop. But today, he isn’t, and Daisy disappears. When Daisy goes missing, nearly everyone in town suspects or knows something different about what happened. And they also know a lot about each other. The immigrants who work in the dairy farm know their employers’ secrets. The hairdresser knows everything except what’s happening in her own backyard. And the roadkill collector knows love and heartbreak more than anyone would ever expect. They are all connected, in ways small and profound, open and secret. Deborah E. Kennedy is a native of Fort Wayne, Indiana and a recent graduate of the Iowa Writers' Workshop. Kennedy has worked as both a reporter and editor, and also holds a Master's in Fiction Writing and English Literature from Miami University in Oxford, Ohio. Tornado Weather is her debut novel. "A wonderful novel. 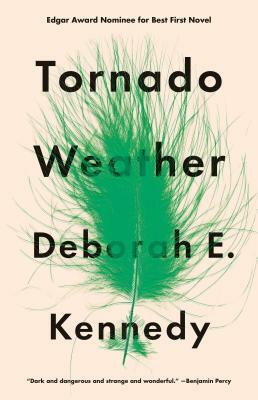 Deborah E. Kennedy's Tornado Weather has a very distinctive energy, and there is real pathos along with subtle humor. The characters are from a social class that is too often overlooked and misrepresented. Kennedy gives them their due, with all their resourcefulness, resilience, and suffering intact." "Kennedy’s engrossing portrait of rural Indiana is as compassionate as it is knowing. In language that is searing, knowing, and often brutally funny, Deborah Kennedy brings an entire rural town to life. Without condescension or caricature, she draws out the intertwining threads in the lives of a town populated in equal measure by the feckless and the blameless—and examines the fabric of small town America—its poverties and prejudices, the preoccupations and hopes of a group of people striving to live their lives in a place that prosperity has left behind. Tornado Weather holds to the light the curses that nature sends, the curses we bring on ourselves, the curses we outlive and the curses we break—the ways of the human heart both bright and dark. Truthful and timely, Kennedy’s vision will spin you up into its still, silent, eye, wreck every bone in your body and touch you back down into a landscape that has been utterly transformed. Simply breathtaking. Chase this one like the tornado that it is."